Bahraini Justice authorities have charged 60 individuals, all of them Shia, for forming a terror group and planning to carry out terrorist attacks as the small gulf country, led by a Sunni minority, continues crackdown on angered Shia majority. Forty-seven of the men are set to appear in court next month, in mass trial, reports say. They are accused of “forming a terrorist group, undergoing training in the use of weapons and explosives with the aim of carrying out terrorist attacks and the deliberate killing of policemen”, Ahmad al-Hamadi, public prosecutor told the media. The 13 others who will be tried in absentia have reportedly fled to Iran, Iraq and Germany. 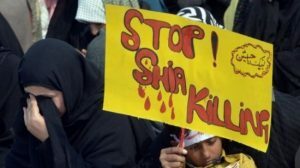 Bahrain has been embroiled since 2011 in protests and riots by majority Shia which authorities claim have been receiving support from regional Shia nation, Iran. In June, the Supreme Court found 26 defendants guilty of forming a “terrorist group” between 2011 and 2013, possession of weapons and Molotov cocktails, and attempting to kill policemen in the Shiite-dominated village of Diraz, west of capital Manama. Five people were killed in May after police opened fire to break a month-long sit-in in front of the house of a top Bahraini Shia Cleric sentenced to one year in prison for corruption. Written by: KanelkaTagba on July 28, 2017. Posted by KanelkaTagba on Jul 28 2017. Filed under Gulf News, Headlines. You can follow any responses to this entry through the RSS 2.0. Both comments and pings are currently closed.